Have you been enjoying all of the freebies and festivities that have come along with our new store opening?! 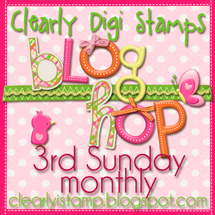 Well, it's the 3rd Sunday of the month, which also makes it our blog hop day! Each month we will have a theme which each Design Team member is challenged to interpret any way they like. We ask that you browse through each Design Team member's post and leave them an encouraging comment....short or long, they all are appreciated! There will be a prize each month! Each DT member is showcasing a digital image, and you could win that image! There will be a winner from each participating DT member's blog. WINNER: The winners will be randomly chosen from comments received on DT member blogs. The winners will be announced on the CDS blog Thursday, May 23rd. Let's go look and see what my other DT members did! Remember, leave an encouraging comment and be entered to win our contest....the more comments, the more times you are entered! Have fun hopping, my friends, and be sure to leave comments along the way! You could be the winner of a digital image! Hope your day is filled with blessings and stamping galore! Great hop! I loved the inspiration from the DT! Thanks for sharing your fabulous talents with all of us!! A quick thanks for the free digis, quick because I'm anxious to see the inspiration your talented DT has created for this blog hop! Such a beautiful hop today. I love seeing the use of the new digis and Thank you for the many freebies. I have to say I really love the over all look of the new store and how easy it is to use it. I like the easy of browsing on the home page with each slide. The easy of downloading the freebies. I like that you can hover over the image and see details of it. I also like that you can click on them to make them lager. I like the drop down button to search and filter a category. Last I love that the gallery is based on the Month and year photos have been added. It makes it easy to go back and past creation and inspirations. I also like that you can browse each card or do a slide show. Well that's all I have. Great creations and love the easy and over all look of the new store. Truly enjoyed the flower themed blog hop. Clear Dollar has a new name. My first stamp order on line and my first digi stamp order were both from Clear Dollar. The talent from artists and DT have been amazing over the years. Thank you for another blog hop - I am looking forward to viewing the creations of the DT. Have a wonderful week! Fun hop! I loved all the creations but I couldn't find a post for Laura (love her blog anyway). Thank you for the new hop! Always a really good time! What a great hop. Everyone did a fantastic job. Thank you for the hop and the chance to win!! Just the inspiration you need....a CHALLENGE!!! We have an ALL DAY CHALLENGE winner!! The word for the day is.....NEW!!!! THE FINAL DAYS OF OUR MOVING SALE! Thank you for a Wonderful Day of Crafting! Challenge #4 - A sketch for your inspiration! Challenge #3 - Pick a Holiday.....ANY Holiday!! Get Ready for Some Fun....THIS SATURDAY!